A loan of $10,000 helped this female entrepreneur to grow her social enterprise, supporting artisans in Tunisia, and employing formerly previously incarcerated men and women in the US. I was born in Iran and immigrated to the USA with my family at the age of 7. Less than two years after our arrival, the Iranian Revolution and the Hostage Crisis occurred. I think that is where my deep desire to bring together my two cultures (Iranian/American, East/West, Muslim/Christian) was realized. I've worked in the NGO world for the better half of my career, focused much on NGOs that promote cultural and educational exchange. We visit Tunisia often with my husband of 12 years, a Franco-Tunisian. Over the years, while visiting Tunisia, I fell in love with their crafts and culture. I also felt deeply inspired and guided to find a deeper purpose linked to this East/West divide. The Arab Spring had begun in Tunisia with one frustrated small business owner setting himself on fire. I had been a fan and small loan giver of Kiva since 2010 after reading Nicholas Kristof's book Half the Sky, in which Kiva was mentioned. What if we also helped in our own small way, supporting artisans and small businesses in Tunisia by importing their products, and helped locally by reaching out to help the marginalized of Los Angeles? In doing so, we could help to bridge this gap between our cultures by showing how connected we all are through the basics of life: beautiful, simple, useful items such as towels and soaps. Step by step, with much discernment and pragmatic preparation came the idea of Balthazar & Rose. We import artisanal Tunisian towels called Foutas, as well as a wonderful product called Aleppo Soap made by a Syrian Aleppo Soap Master. Both are ancient traditions of the East that fit effortlessly into the modern world. My small business was born of inspiration from travel to my husband's country, Tunisia, and from a love of simple gifts from other cultures that fit effortlessly and purposefully into the modern lifestyle. One such gift was the Fouta (Tunisian multi-use towel) and more recently, the addition of our Aleppo Soap (Savon d'Alep) made by a Syrian Aleppo Soap Master. We are so proud to bring these treasures to the United States and to share their special stories and the lives they touch. Aside from helping in our own small way to support the economy of newly democratic and fragile Tunisia (and the Winner of the 2015 Nobel Peace Prize), it is our honor to also engage with our local community (Homeboy Industries*) in the packaging of our soaps, give a percentage of proceeds of the Aleppo Soap to the Jesuit Refugee Service (since our soap launch in late 2016), and 2% of profits of the towels to Kiva loans (since 2014). *Homeboy Industries is an LA based social enterprise that "provides hope, training, and support to formerly gang-involved and previously incarcerated men and women allowing them to redirect their lives and become contributing members of our community." Their motto "Nothing stops a bullet like a job" and it is of course, also about healing. I began my business in late 2014 cautiously (with limited inventory) and hit the Farmers Markets! I did well and with confidence, in 2015, despite production and import issues, managed to have a half a year of sales, obtain presence in 10 boutiques (wholesale) and expand the line from just Towels to begin the research phase of the Aleppo Soaps. 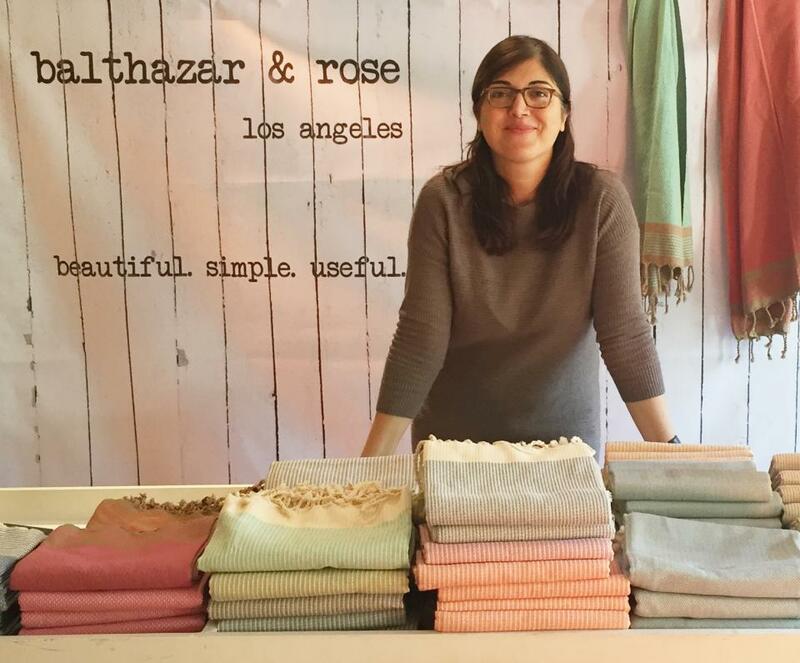 In 2016, I was incredibly active in Farmers Markets & pop-ups, and was accepted at a Show Room, increasing wholesale presence to 50 boutiques. The goal for 2017 is to attend a first Tradeshow (fees, marketing material, booth), improve my website and online presence/marketing, and purchase more inventory, particularly Aleppo Soap. Why are you endorsing Ellie? This model has tremendous potential as a social enterprise. It imports soap and towels from Tunisia. The organic products are packaged by Homeboys in LA and she's trying to create a Tunisian Homeboys model as well to package there. I've had the time to coach this model personally, so I know Ellie is honorable and worthy of support. The model itself is already profitable and West Elm agreed to sell it. She's in a cash flow crunch like most small businesses. I feel she will repay this loan.